Things are starting to get pretty exciting at Capital One Arena…! 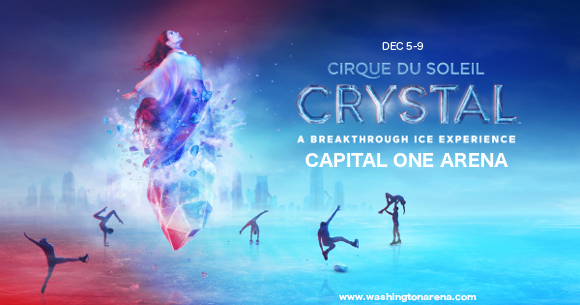 Cirque du Soleil returns with an all new hybrid show; Crystal, a never-before-seen mix of ice sport and acrobatics, heads to Capital One Arena on Friday 7th December 2018 for a wintry performance that will challenge everything you thought you knew about the capabilities of the human body! Adults and children alike will be enthralled – so don’t miss it! Grab your tickets to catch Cirque du Soleil: Crystal at the Capital One Arena NOW while they last!! Described by the Montreal Gazette as; “lot of fun, effortlessly blending the eye-popping acrobatics of the Cirque with the blade action of an ice show,” the latest show from the world-renowned physical arts company has taken audiences by storm wherever its been performed so far. Focusing on the character Crystal, who falls through the ice while skating and is transported to another realm, every minute of Cirque du Soleil: Crystal will transport you to another world, one where hoop artists spin through the air and skaters perform death-defying stunts from ramps with beauty and grace. It’s a truly magical show – but don’t just take our word for it – make sure you see it with your own eyes! Tickets available now! !